Are you tired of missing your target? Do you want to improve your split times? Are iron sights getting a little too hard to see? Well if any of these apply to you, you may want to consider a best red dot sight. The optics realm is massive with tons of choices and diverse sighting systems. There is variable scopes, fixed power scopes, scopes for long range shooting, scopes for close range shooting, and more. In the world of modern optics, the red dot reigns supreme. Red dot scopes are close to medium range optics that are perfect on nearly any weapon platform. These ultra-modern optics are designed to give shooters something more intuitive than iron sights. Red dots allow faster reactions and more precise rapid fire than iron sights ever could. They are easy to use on an open range, and inside the home. They are simple and take very little training to learn to use. The red dot is likely my favorite style of optic, but I can’t choose just one. In time my time in the firearms industry I’ve gotten to handle and shoot dozens. There is a few I always come back to, and I wanted to share those with you today. The red dot sight is likely my favorite style of the optic, but I can’t choose just one. In time my time in the firearms industry I’ve gotten to handle and shoot dozens. There is a few I always come back to, and I wanted to share those with you today. 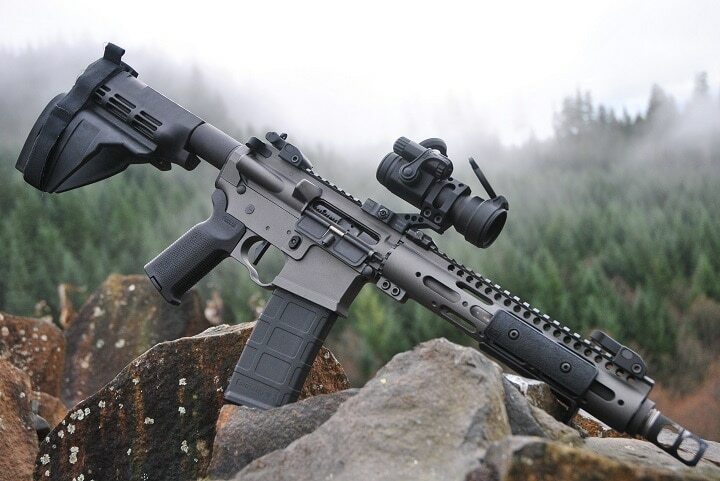 The rifle, or carbine, is an extremely versatile weapon platform that is lightweight, easy to control and the perfect candidate for a red dot optic. The rifle is excellent for both close-quarters combat and long-range shooting. With a red dot sight, you can maximize your potential in close to moderate range shooting. Add a magnifier and now you have an effective optic out to 500 yards. The red dot has been widely accepted for rifle use by the military, police forces across the country, as well as home defenders. ​My Favorite Red Dots Are as Follows. The SIG Romeo 7 is a mid-priced optic from SIG’s newest line of red dots. This is a full sized red dot designed specifically for the Modern Sporting rifle. It excels on the AR 15, the AK series, and any other rifle that shoots fast and hits hard. This is a big optic, its 30mm objective lens makes it one of the biggest and most affordable full sized red dots on the market. The optic is fully multi-coated, made in the United States and is IPX-7 rated for I meter submersion. Romeo 7 has one of my favorite features of all times, the MOTAC system. MOTAC is SIG’s system for turning the optic on and off. The optic detects motion and will automatically turn on, and after being set still for a long period of time it will automatically shut off. When the MOTAC system turns the optic on it brings it right back to the brightness level you’ve left it at. This is incredibly handy in self-defense, or home defense situation. Something goes bump in the night you grab your gun and the optic is on. The Romeo 7 comes with a QD mount and is made from CNC 6061 aluminum material. 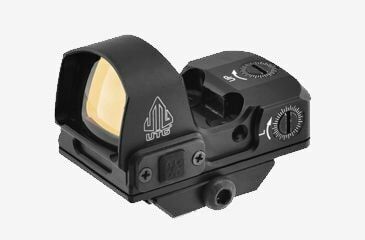 The optic utilizes a 2 MOA red dot, and low dispersion glass lens for excellent light transmission. 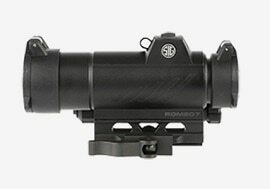 The SIG Romeo 7 is an outstanding optic at an impressive price point. If it's good enough for the United States Army, it’s gotta be good enough for you right? The Aimpoint Comp M4 is in fact the choice of the United States Army and its served well throughout its time in the Global War on Terror. It had a reputation to keep, and when Aimpoint literally invented the red dot it's hard to be anything but perfect. This is a go to war make no mistake about it. Drop it, kick, toss it in a pool, and it will just keep working. That little red dot seemingly never failing. The Comp M4 is completely shockproof, and submersible up to 150 feet. Go ahead and take it for a swim. The M4 is at home on any semi-automatic rifle and can easily engage targets out to 200 meters. 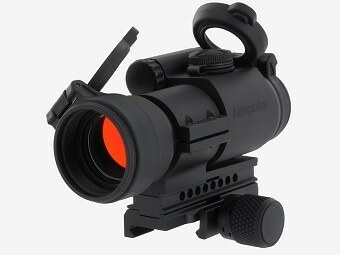 Add the AP magnifier and you can reach out and touch targets well beyond that. The Comp M4 is perfect for quick and accurate shooting and excels in close quarter’s battle. The optic has 7 night vision settings and 9 daylight settings. This is a tactical optic so if it wasn’t NVG compatible it’d barely be useful. This is a full-sized optic and the lenses are fully multi coated for a bright and clear picture. This kind of coating makes a big difference indoors, or in low light situations. It allows you to pick up on fine details you may miss with a cheaper optic. 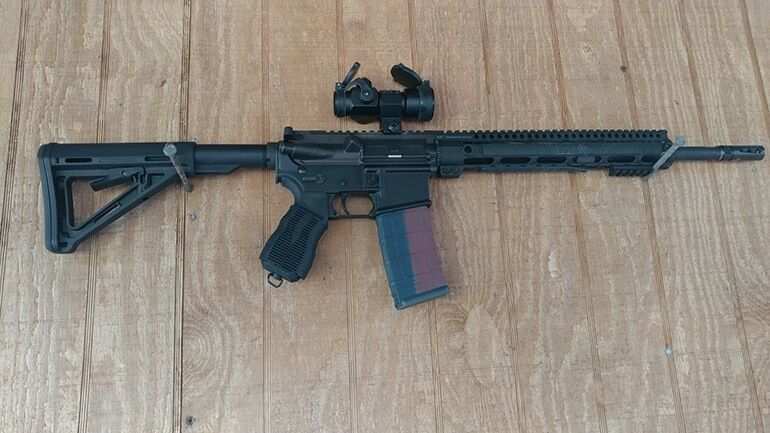 If budget isn’t a concern, it's hard to beat the Comp M4. 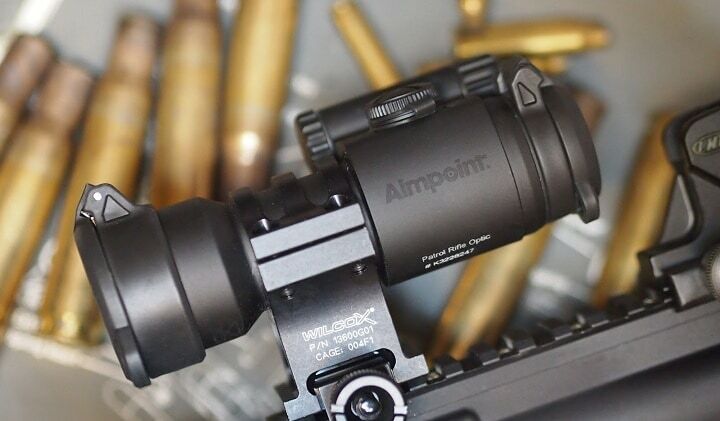 Aimpoint Pro is set to turn on and leave alone for up to three years. 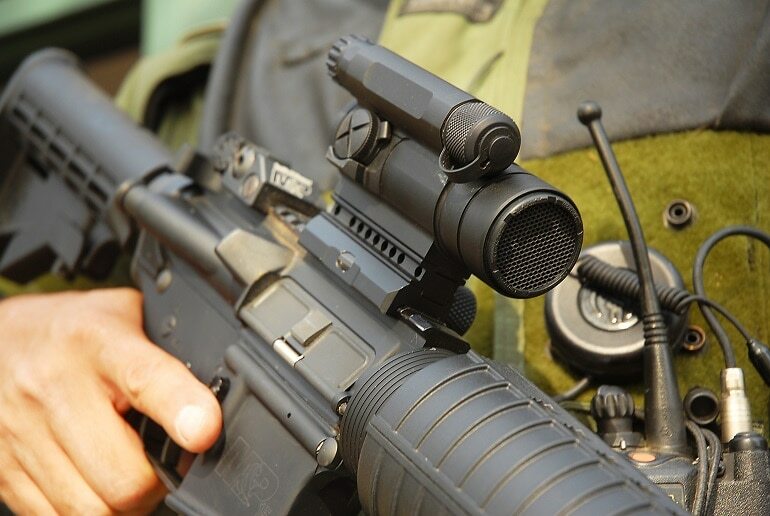 Much like the well known ACOG military optic this unit is designed for police and military applications. I tested this optic years ago at the American Shot Show writer events day. After that, I took it into the field and still loving it in close range shooting. It is a top end system with mil-spec quality attached to the system. And is shockproof, fog proof and waterproof. The unit retains a 2 MOA dot size for accurate targeting and requires no switches when activating the unit for use. This is not a starter tool by any means and is designed for the pro, being the gunfighter or hunter. 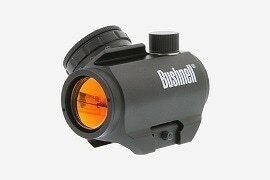 The Bushnell TRS-25 is considered a better grade red dot sight. 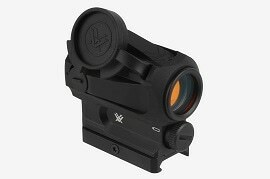 Measuring 5.4X3.4X 2/2, this compact sight is quite well-liked by many shooters. At a power setting of 1X25mm, TRS-25 is designed for close range hunting rifles, scout rifles, and AR's and helps shooter in fast target acquisitions. It works with an amber brightness that allows the shooter to keep both eyes open and maintain the complete awareness of the general surroundings. 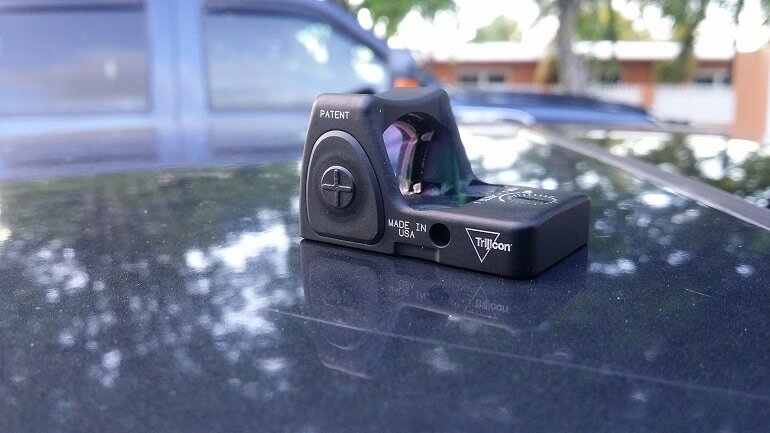 This red dot sight is a small package with some big-time rules of the road. 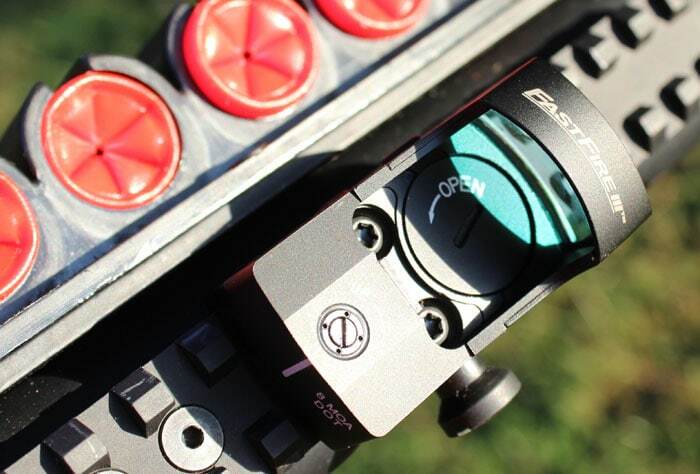 The control knob system is built somewhat tight in turning because this is required when being afield, or removing the sight and firearm from a tight fitting case. Adjustment knobs could inadvertently get rotated thereby changing the red dots zero setting. 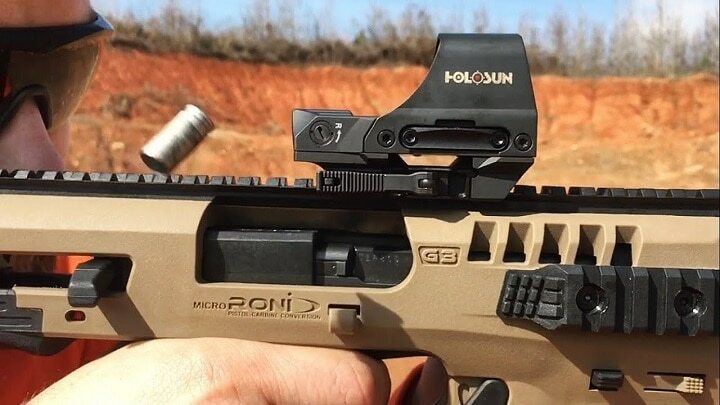 For best operational results think about installing this sight on a Hi-Rise mounting block that comes with the sighting system. Weaver type rails are used to attach the optic to the receiver of the firearm. When using this system don't adjust the brightness of the red dot to high. This act can obstruct the target in even bright lighting conditions. For sure you can blind your self with a fuzzy red glow in low light conditions. This is the only drawback of this red dot sight. 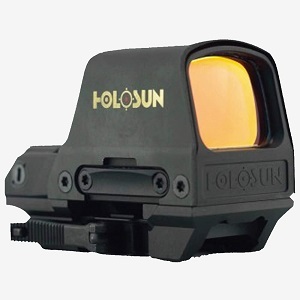 The Holosun is a best holographic sight that can be used with both eyes open or one eye closed. The sight is fast, accurate, and designed for close range entry support work, or brush shooting game. The LED technology allows the shooter to get the 5,000 hours of battery life from a single battery, You could say this reflex sight is state of the art in design and you would not be far off base at all. 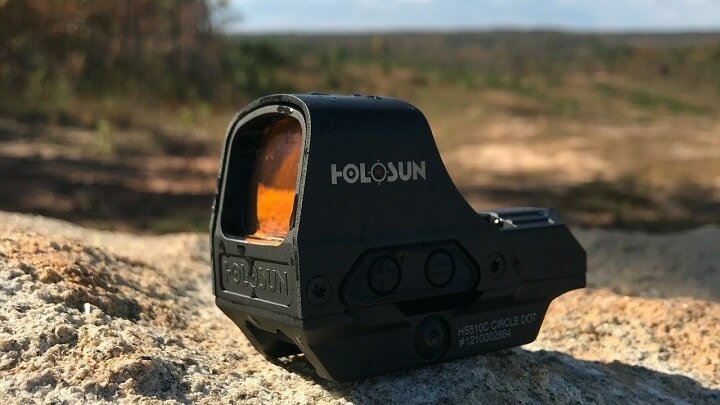 Holosun allows the choice of a 2 MOA dot reticle, or 65 MOA ring reticle. The system has an unlimited field of view, a titanium alloyed and shock resistant frame, and powered by the battery and solar energy. If there is something not to like about this sight I would very much like to know about it. The unit is mounted by way of a QD mounting system that makes way for easy attachment and removal in a fast time model of function. 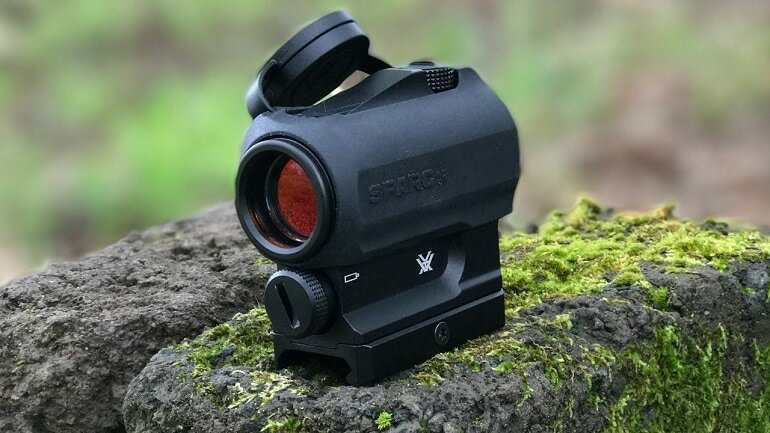 If you are looking for something simple and affordable in the red dot market I’d point you to the Vortex SPARC AR optic. Vortex came out of nowhere a few years ago and proved that high-quality red dots could be affordable. Prior to Vortex, the market was either extremely expensive and high quality, or cheap and junk. Vortex delivered something in the middle. 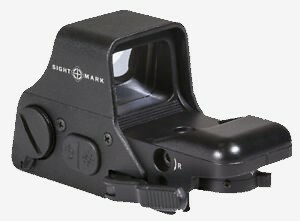 The SPARC AR was one of those affordable and reliable optics. The SPARC AR isn’t a go to war, Navy SEAL red dot sight. It’s a simple, reliable optic that just works. To keep the price low and the quality high the SPARC AR stays simple. The SPARC isn’t fancy in any way. What it excels at is the basics. The SPARC is a smaller red dot scope that’s sporting a 2 MOA reticle and it features 10 different settings. The lowest 2 settings are even night vision compatible. All air exposed glass is hit with an anti-reflective multi-coating that reduces glare and improves clarity. The SPARC is sealed with O rings to prevent moisture build up, fog, and dust getting into the system. The SPARC AR uses a single AAA battery and has around 5,000 hours of battery life. With AR in the name, it's not hard to see exactly what this optic is made for. It co-witnesses perfectly with AR 15 iron sights. The SPARC AR is an exceptional little optic for the price range and its perfect for competition, the range, or home defense. Its backed by a fantastic warranty and perfect for both ARs and other modern semi-automatic rifles. 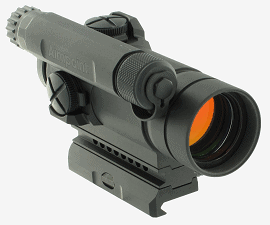 This Sightmark is holographic sight will display both red and green dots and makes use of digital switch controls. It maintains 35 through 100 meters field of view. This system makes use of an hour power down so as to save batteries. 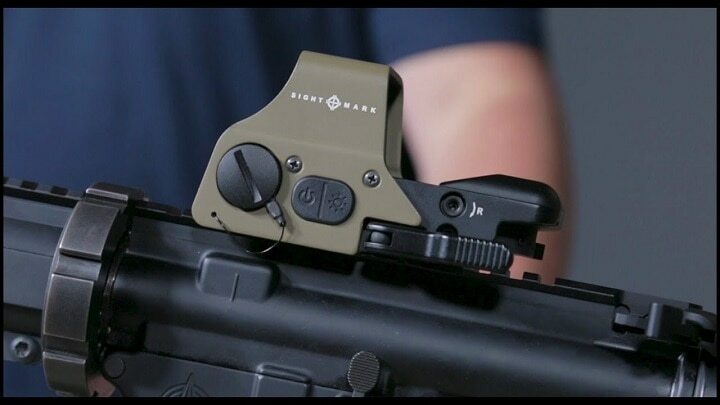 The optic uses the adjustable quick detach Weaver style mount, and is parallax correctable. 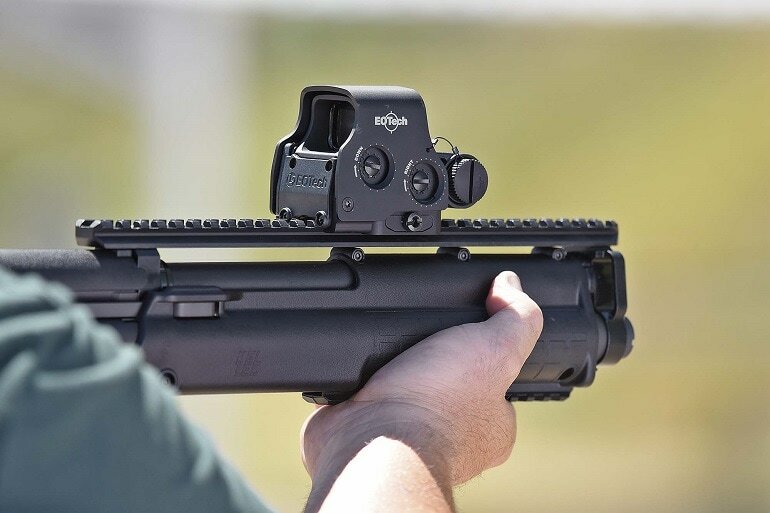 This 4 MOA red dot sight is best suited for larger targets and center mass shooting. Machined from 6061 -T6 aluminum the sight is well made and able to withstand abuse as in hard field use. The red dot retains six power levels in terms of intensity, meaning it is workable in bright and low light conditions alike. The previous brightness level is retained by the built-in memory in the scope upon activation. 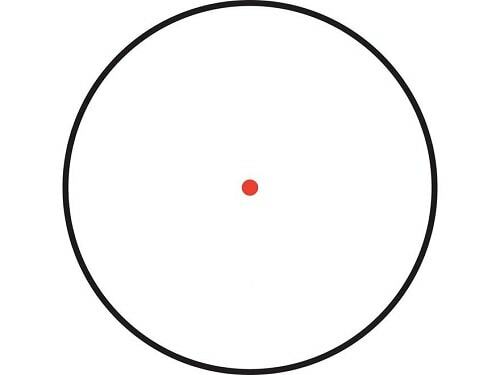 Based on the materials this micro red dot has been constructed of this red dot should last the buyer some time, and offer some positive results. The shotgun is a brutal weapon. It's the modern equivalent of a battle axe. It's a close range, brutal weapon not made for everyone. 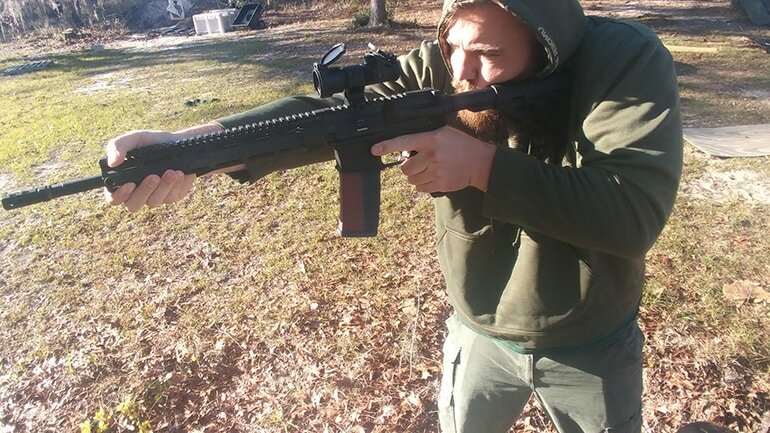 The shotgun is a close range weapon and is the perfect candidate for a red dot optic. 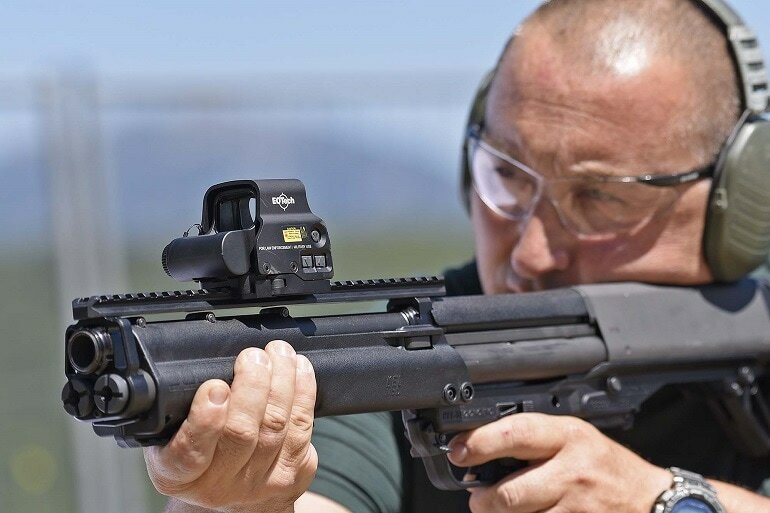 Close range shooting emphasizes speed over accuracy in many cases and a red dot sight is faster than a bead sight, faster than slug sights, and faster than ghost ring sights. The Shotgun and the red dot are a perfect pair. A red dot can be used to more effectively hunt, to shoot birds, and of course for home defense. Here is my three favorite shotgun red dot systems. The SpeedBead is designed specifically for shotguns and a perfect companion to any competition, combat, or clay shooting shotgun. This is more than an optic, its a mounting system and optic combination. 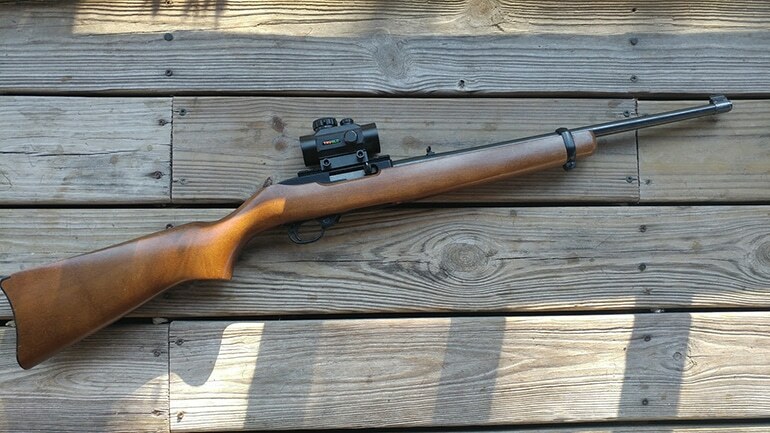 It's designed to mount between the stock and the receiver. This lets it sit low on the gun and give you the same effect as a shotgun’s traditional bead sight. This gives you that excellent pointability factor you get with a bead sight. It aligns perfectly with the vented rib that sits on a wide variety of shotguns. The SpeedBead is a lightweight mounting option that gives you that instinctive shooting ability. On top of the optic is a miniature red dot, specifically the Burris FastFire 3. 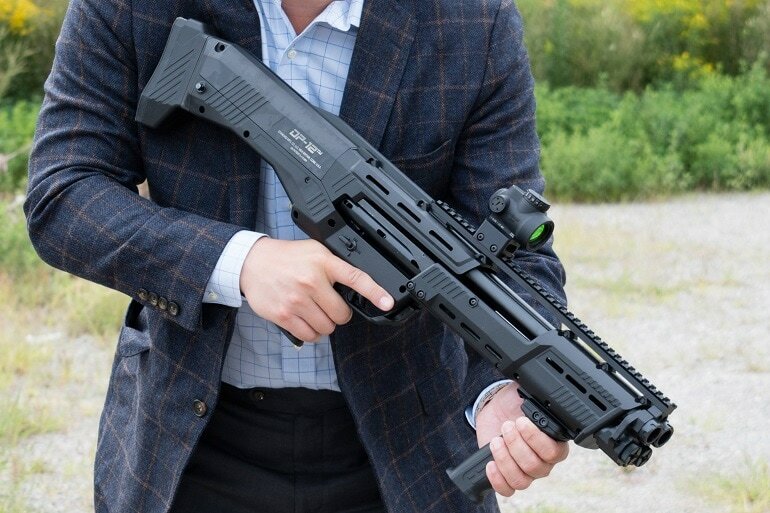 The FastFire 3 is perfect for the shotgun. It's designed for two eyes opened shooting and allows the shotgunner to get on target much faster than a traditional bead sight. The FastFire 3 has an automatic adjustment setting that will automatically adjust the reticle brightness level to compensate for the external light sources. There are also 3 manual settings The optic is shockproof, fog proof, waterproof, and designed to hold up to the recoil of a 12 gauge. The FastFire 3 is a ferocious little optic and it really helps reduce the time it takes to get on target. The illuminated reticle can be tracked by the eye regardless of how low the lights are. You can track flying targets, running targets, or simply take precise shots without issue. 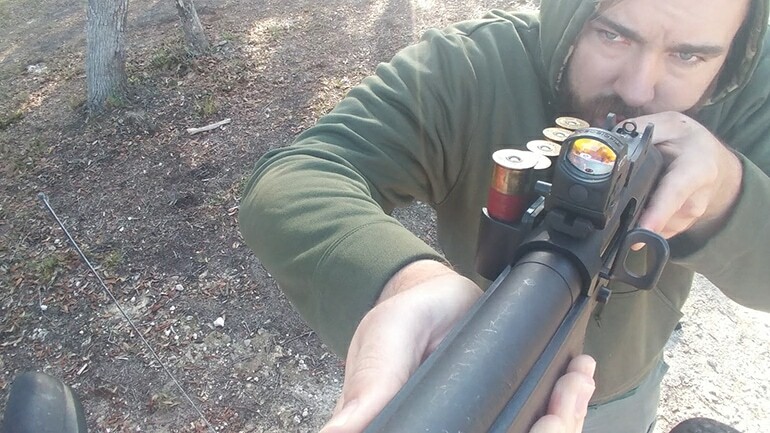 This is an ingenious system that really changes the entire dynamic of your shotgun. 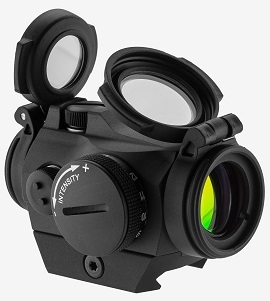 The Trijicon MRO is one of Trijicons newest optics coming out only a few years ago. The MRO is a compact red dot sight designed for combat use. Like everything else made by them, this is a go to war optic. It's designed to take all the abuse you can toss at it. The MRO is waterproof up to 30 meters, is made from aircraft grade aluminum, and is completely shockproof. It will laugh at the recoil of any shotgun. The MRO sports ambidextrous brightness controls which are a blessing for those left-handers out there. The system runs on a single lithium battery that will last 5 years of continuous use. 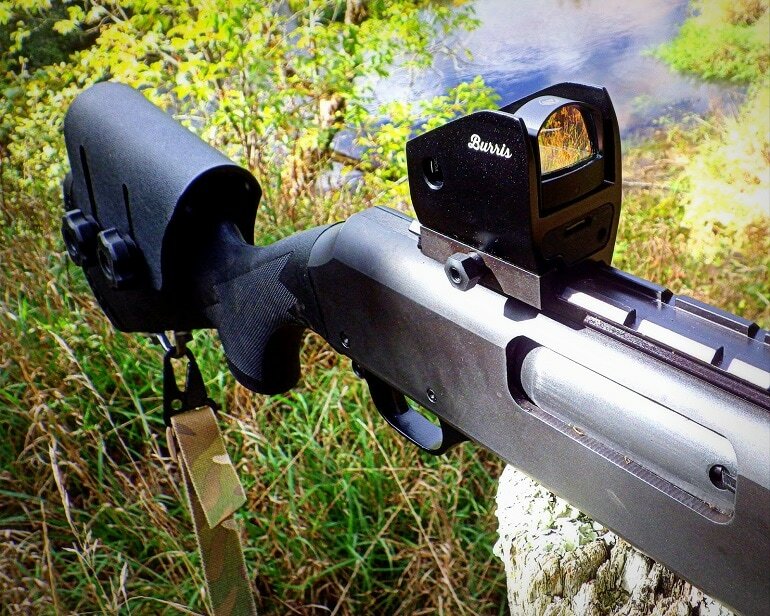 The MRO comes in a variety of different mounting options and for a shotgun, a solid low mount setup is best. The MRO’s small size makes it unobtrusive, and lightweight. 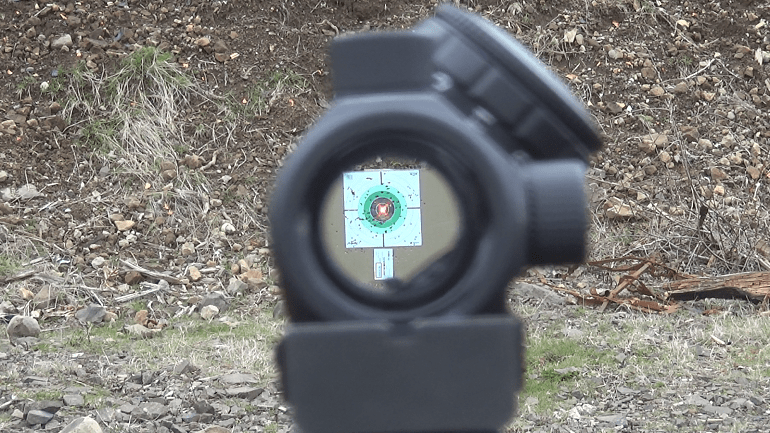 The optic delivers a crystal-clear sight picture and the 2 MOA dot is just perfect. The dot doesn’t washout as it gets brighter and stays crystal clear. It's easy to see and precise enough to be unobstructive. The reticle has 8 different brightness settings with 2 of them being night settings. The brightness adapter even features a mid-position off switch that’s handy. This means you don’t have to cycle through every setting to find that perfect one. 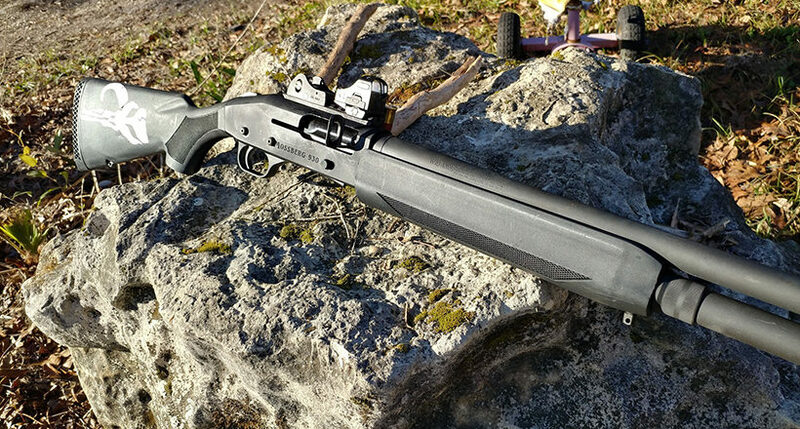 The MRO is an outstanding optic if your shotgun is made for combat. The XPS3 is the little brother of the Eotech line of optics. I believe shotguns should be lightweight, fast acting reactive weapons. Having a small, but capable optic is a major advantage. 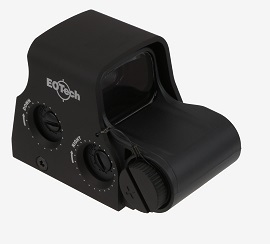 The XPS3 uses Eotech’s famous Circle and dot reticle. While designed to be used by a multitude of guns I've always found it to be excellent for shotguns. The end user should pattern their shotgun with the reticle and they can then use it judge exactly where the shot pattern will hit inside the circle at different distances. The small dot in the center can then be used for slugs over for more precise, long range shooting. The XPS3 is even compatible with night vision devices. 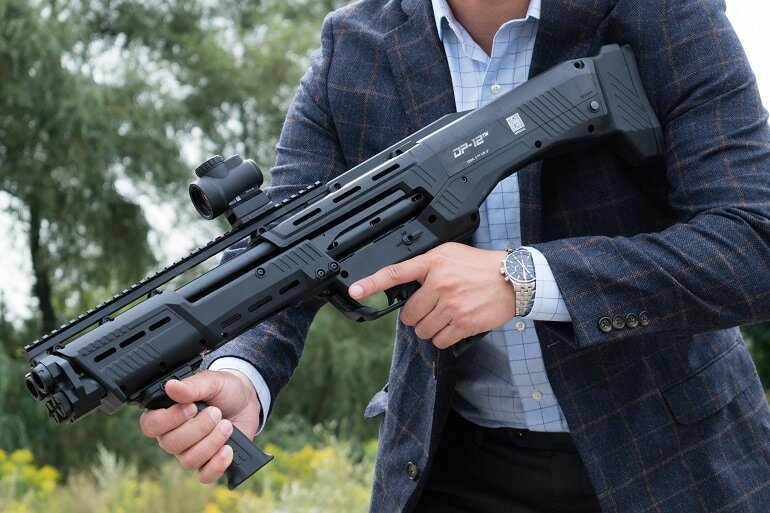 The XPS3 combined with a night vision device would your shotgun one lethal, hog killing machine. The optic is intuitive, easy to use, and offers shooter easy ambidextrous operations. The easily adjustable reticle brightness gives you 20 daylight settings and 10-night settings. The system functions on a single 123 battery and will last 600 hours on setting 12. The shotgun is a versatile weapon, and the XPS3 is a versatile optic. They work hand in hand with each other well. This is perfect optic for hunting everything from deer to birds, as well as home defense and tactical use. 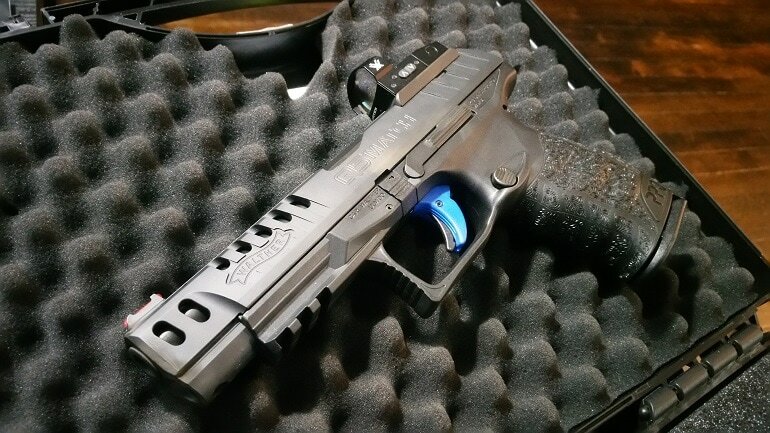 Optics on handguns are a rather new concept. It was born form optics makers taking small and going even smaller with it. While initially many micro red dots were made as backups for rifles, the concept flourished on the pistol. Red dot equipped pistols are easier to shoot faster, allow shooters to hit targets further away, and improves the precision of the weapon. Red dots on handguns is a growing trend and not one likely to disappear anytime soon. 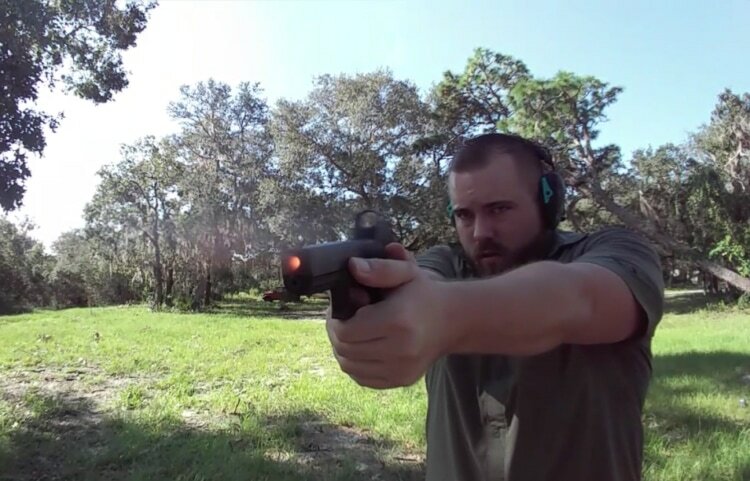 The RMR is the handgun optic for combat and duty handguns. The RMR is by far the strongest and most dependable miniature red dot optic on the market. The dual illuminated model even allows the user to mix both batteries and solar power. The RMR Dual illuminated is my choice for combat and duty handgun red dot sight. During the day, or when you are exposed to illumination, the optic will not use battery power. In a dark, or low light situation, there is a battery backup. This extends the life of the unit and ensures its always running when you need it. It's also made for combat and made to last through exposure to the fiercest of elements. This includes water resistance up to 66 feet and completely shockproof. The RMR is built from forged aircraft grade aluminum but weighs only 1.2 ounces. 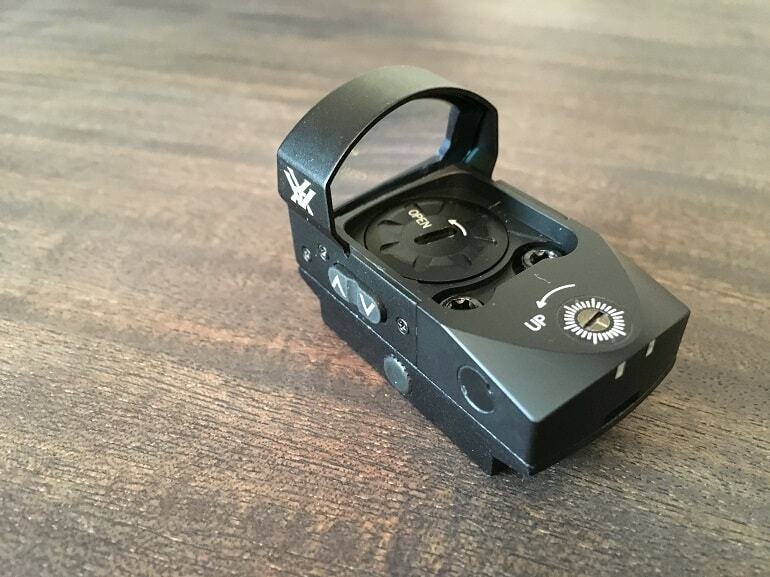 This miniature optic is also crystal clear, and users have options for red, green, or amber reticles. I tend to prefer the green since your eye catches it 66% faster than red. You also have numerous reticle size options. This includes MOA sizes from 1 MOA to 13 MOA. On a handgun bigger is often better because you want speed over long range precision. Another major benefit is the RMR’s inherent popularity. Due to its popularity, it has commonality with holsters, and gunsmiths. Companies like Glock and Smith and Wesson cut their weapons to be compatible with the RMR due to its popularity. 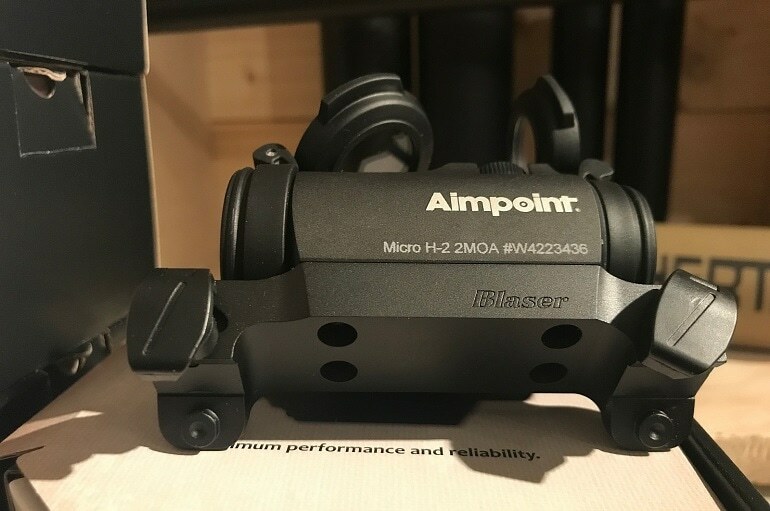 When it comes to handguns designed for hunting both game big and small the Aimpoint H2 is the optic to go for. What’s fascinating is that both large caliber hunting revolvers and small rimfire automatics are almost always optics ready. A red dot gives you a more precise, faster shooting option for hunting anything from cape buffalo to rabbits. This is designed specifically for hunting, but there is no reason it couldn’t be used for target practice, competition, and general plinking. The H2 is a miniaturized red dot, but it uses a traditional circular tube over a square shaped lens. The H2’s lenses are coated with an advanced optical coating that allows the shooter to see a crystal-clear sight picture. The H2 optic is somewhat large for a handgun, but it’s made for large handguns. The H2 gives you a broad and wide sight picture that’s crystal clear and perfect for hunting in lower light conditions. The H2 is only 4.79 ounces with mount and lens cover. Speaking of mounts the H2 has a nice integral weaver/Picatinny base. This gives shooters an integral mount system for attaching to the most common form of scope rail in the world. This allows it to be easily mounted on most hunting handguns. The H2 runs off a single CR2032 battery and can last through 5 years on continuous use on the moderate setting. Speaking of settings, the H2 has a total of 12 brightness settings that are adjustable via the user. From squirrels to hogs the H2 can take em all. If you are on a bit of a budget or looking for an optic more aimed at competition and sport shooting than combat I have one for you. 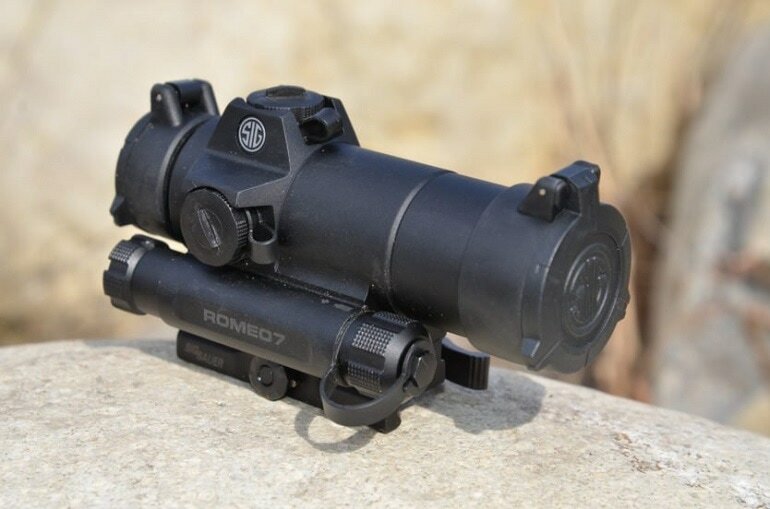 The Venom is a well-made, affordable, and all around great optic for a wide variety of purposes. 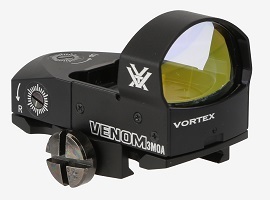 The Vortex Optics Venom is a miniature red dot sight that utilizes a square style lens. That lens is coated with a vibrant multi coating that gives the user a crystal-clear view through the optic. 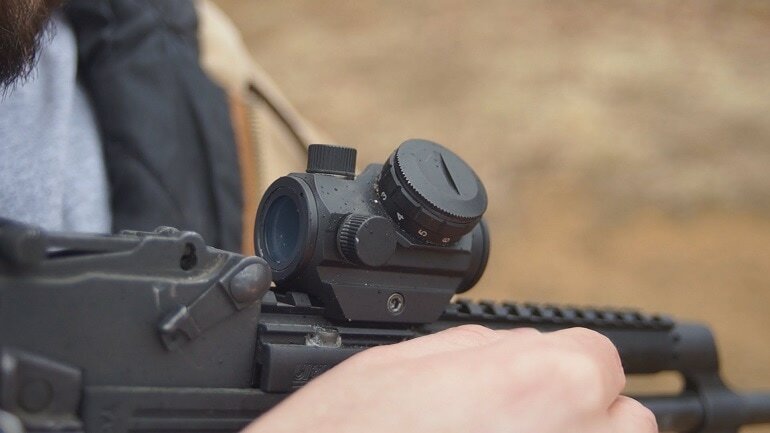 The coating helps protect the glass in the event of debris gives it a kick, and it makes the red dot reticle really stand out and be ultra-visible. That multi coating will help maximize the clarity of both the dot and the sight picture. The Venom weighs a mere 1.1 inches without it’s picatinny mount. The optic follows a popular screw pattern for direct attachment. 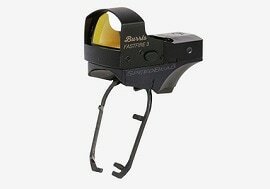 This makes it simple to find the right mount for your optics ready handgun. This optic is compatible with the Glock MOS series of handguns. 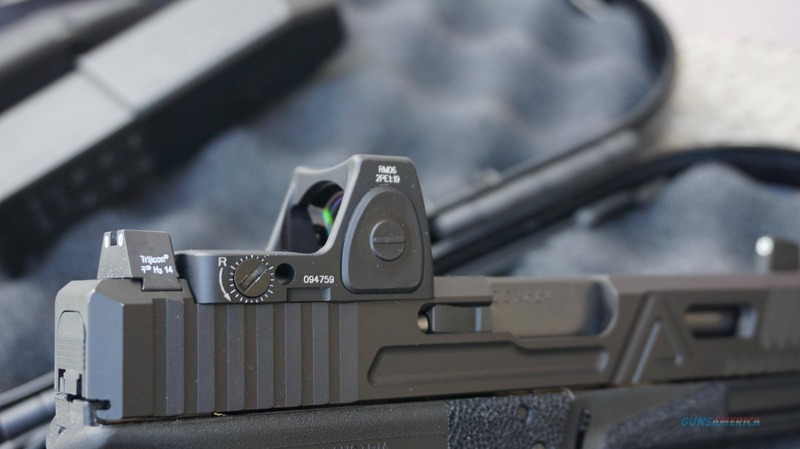 This is quite popular sight among Glock shooters and that is the reason you will find it on every best Glock sights list. The Venom use a top load system for the battery. This is a feature you learn to love after years with a red dot equipped handgun. Top loading means you don’t have to remove the optic and potentially lose zero just to change the battery. There is no need to break your lock tite or anything crazy just to keep the optic running. The controls are placed on the left hand side of the optic so it’s more for righties than anyone, but the controls are simple enough that you can do it with your off hand. There isn’t a better budget red dot handgun optic on the market. So, these are some of my favorite red dot optics. What are yours? Any you agree with, or disagree with?